Foreign Minister Hor Namhong met with US Deputy Assistant Secretary of State Joseph Yun, who is in charge of Asia Pacific, on Thursday. 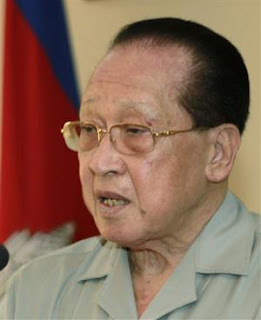 "Hor Namhong requested that debt be lowered by 70 percent, to about $133 million, and that interest be lowered from 3 percent to 1 percent." Cambodia has asked the US to decrease its Lon Nol-era debt and to decrease the interest rate on the balance, officials said Thursday. Foreign Minister Hor Namhong met with US Deputy Assistant Secretary of State Joseph Yun, who is in charge of Asia Pacific, on Thursday, over some $445 million in debt accrued during the Lon Nol era. Hor Namhong requested that debt be lowered by 70 percent, to about $133 million, and that interest be lowered from 3 percent to 1 percent, officials said after the meeting. Foreign Ministry spokesman Koy Kuong said Cambodia has changed its position on the debt in order to reach an agreement. The US has said countries typically must repay such debts, despite changes of leaders or regime. However, in a visit in November, US Secretary of State Hillary Clinton said officials would revisit the debt question. Following Thursday’s discussion, Yun said he would take the new debt request back to Washington, according to Cambodian officials present. Yun was not available to reporters following the meeting.